For MediaGuardian’s Facebook Fanpage, I build several applications to bring in information from the official website. We build a photo application called “Top 100 Movers and Schmoozers” which read in photo tags from photos uploaded on the fan page. People tagged in the photos are then shown on the leaderboard. Three RSS applications were also build to bring in official content. This included the latest jobs and new articles from the MediaMonkey and OrganGrinder blogs. 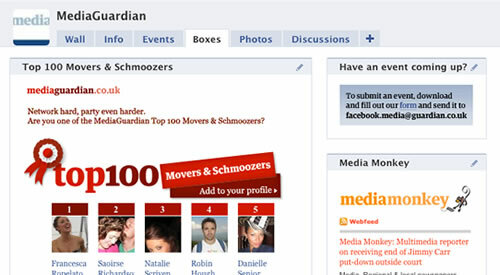 You can see all the application on MediaGuardian’s Facebook Fan Page.